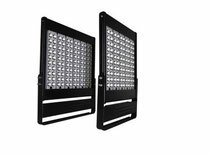 OST Series LED Flood/Spot/Street Light - Light weight and the slimmest design, an ideal combination of performance and style ˙Modular Light Engine design for different power of Flood / Spot Street lights 80w / 100w / 120w (20w each) and max. 120w / 150w / 180w (30w each).˙Patented active cooling design to get the best thermal management, so that the system can reach real life span of 50,000 hours. Modular Light Engine can be upgraded easily by higher LED efficancy.